The IUCN/SSC Tortoise and Freshwater Turtle Specialist Group and Turtle Survival Alliance established the Behler Turtle Conservation Award in 2006, a major annual award presented jointly by these groups to honor leadership and excellence in the field of tortoise and freshwater turtle conservation. The award honors the memory of John L. Behler, previous Chair of the Tortoise and Freshwater Turtle Specialist Group and Curator of Herpetology at the Bronx Zoo, Wildlife Conservation Society. 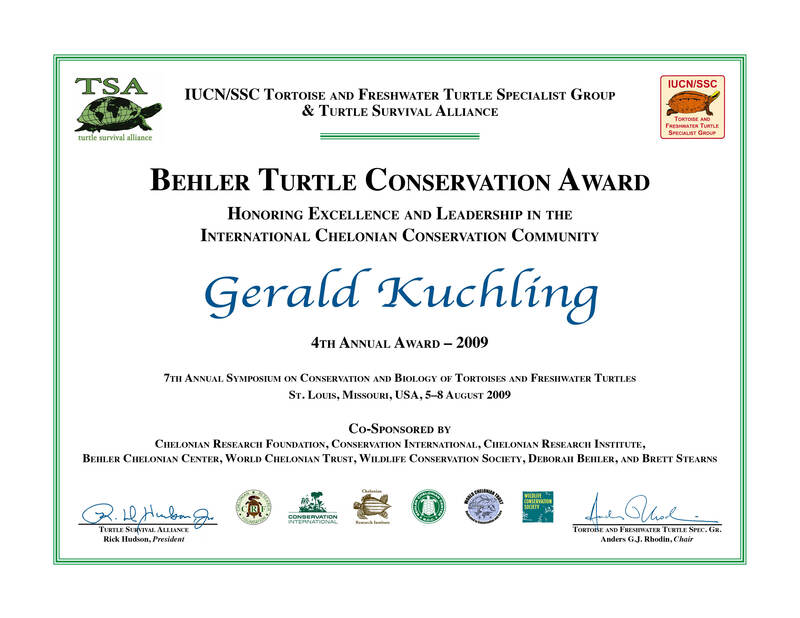 The 4th annual Behler Award was presented to Gerald Kuchling in St. Louis, Missouri, in August 2009 at the 7th Annual Symposium on Conservation and Biology of Tortoises and Freshwater Turtles. Presenting the award were Anders Rhodin, Chair of the Tortoise and Freshwater Turtle Specialist Group, and Rick Hudson, President of Turtle Survival Alliance. The Award includes an honorarium of $3000, and co-sponsors this year were Chelonian Research Foundation, Conservation International, Chelonian Research Institute, Behler Chelonian Center, World Chelonian Trust, Wildlife Conservation Society, and Deborah Behler and Brett and Nancy Stearns. This year’s honoree, Gerald Kuchling, is a life-long turtle researcher and conservationist, whose work in the field has been inspirational for many, as he has almost single-handedly brought at least one turtle species back from the brink of extinction—the western swamp turtle, Pseudemydura umbrina, of Australia. Kuchling has been significantly and instrumentally involved with the conservation and recovery of four of the world’s 25 most endangered turtles (Pseudemydura umbrina in Australia, Erymnochelys madagascariensis in Madagascar, Batagur trivittata in Myanmar, and Rafetus swinhoei in China) and positively associated with conservation efforts for another eight of them (Batagur affinis, Batagur borneoensis, Chelodina mccordi, Chitra chitra, Elusor macrurus, Astrochelys yniphora, Psammobates geometricus, and Pyxis planicauda). One turtle is named after him—a snake-necked turtle from the Kimberley region in Western Australia. A hallmark of Kuchling's approach to turtle conservation has been his focus on reproductive biological research and applied methodologies. His book “The Reproductive Biology of the Chelonia” was published in 1999. Kuchling was born in Austria in 1952 and studied zoology and physiology at the University of Vienna, where he worked as a research assistant in the herpetological collection of the Natural History Museum Vienna from 1972 to 1975 and received his Ph.D. at the University of Vienna in 1979 with a thesis on the control of reproduction in the tortoise Testudo hermanni. After a post doc at the University of Göttingen he started tortoise and turtle surveys and conservation projects in Madagascar in 1984. In the 1990s he developed a conservation strategy and set up a conservation program for Erymnochelys madagascariensis with support of Conservation International and the Durrell Wildlife Conservation Trust. Today a Malagasy DWCT team continues this conservation and recovery program. In 1987 Kuchling and his wife Guundie moved to Western Australia to bring the critically endangered Western Swamp Turtle, Pseudemydura umbrina, back from the brink of extinction. In the mid-1980s this species had a world population of less than 50 individuals and did not breed in captivity. With support of WWF and the Australian and Western Australian Governments he set up a successful breeding operation at Perth Zoo and started to reintroduce captive bred turtles back into the wild in 1994. As Principal Investigator of the Western Swamp Turtle Recovery Team he has guided the recovery planning and its implementation since. While the species still qualifies as Critically Endangered, its numbers in the wild have increased to over 200. Kuchling continues this recovery work as Senior Research Scientist of the Western Australian Department of Environment and Conservation and as Adjunct Senior Lecturer at the School of Animal Biology of The University of Western Australia. In 2002 the collaboration of Kuchling’s business Chelonia Enterprises with the Myanmar Forestry Department lead to the rediscovery of Batagur trivittata, a large river turtle that had not been recorded alive since 1935. He immediately established a captive colony at Mandalay Zoo and developed a conservation strategy for the species. His surveys in collaboration with the Wildlife Conservation Society in 2004 detected two remnant populations in upper Myanmar, one of which is now monitored and protected by a WCS team with the help of local people. The captive breeding and headstarting program of B. trivittata at Mandalay Zoo continues today under the guidance of the Turtle Survival Alliance. Over the last few years Kuchling, working for the Turtle Survival Alliance, assessed and improved breeding projects for critically endangered Asian turtles, including Chitra chitra in Thailand and Batagur affinis in Malaysia. Since 2007 Kuchling has led for the Turtle Survival Alliance the Rafetus swinhoei captive breeding project between the world’s only known female which he discovered in Changsha Zoo in China and the only surviving old male in China in Suzhou Zoo. After Kuchling led the effort to bring these last two turtles together, eggs were laid in 2008 and 2009, many of them fertile, but successful hatchlings have not yet been produced by the old couple. Previous Behler Award honorees have been Ed Moll, Whit Gibbons, and Peter Pritchard. In addition to honoring the life-time achievements of senior turtle and tortoise conservationists, the Award also honors conservation efforts by younger individuals who make major contributions to the field. Recognizing and valuing the often tireless and dedicated efforts made by all these these individuals is important, and the Behler Award hopes to provide some inspiration and reward for those who have demonstrated excellence and leadership on the front lines of global turtle conservation efforts.